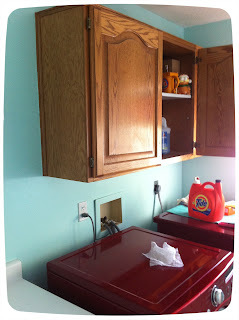 Painting my laundry room cabinets! am I nuts? This is what they looked like before I worked my magic! 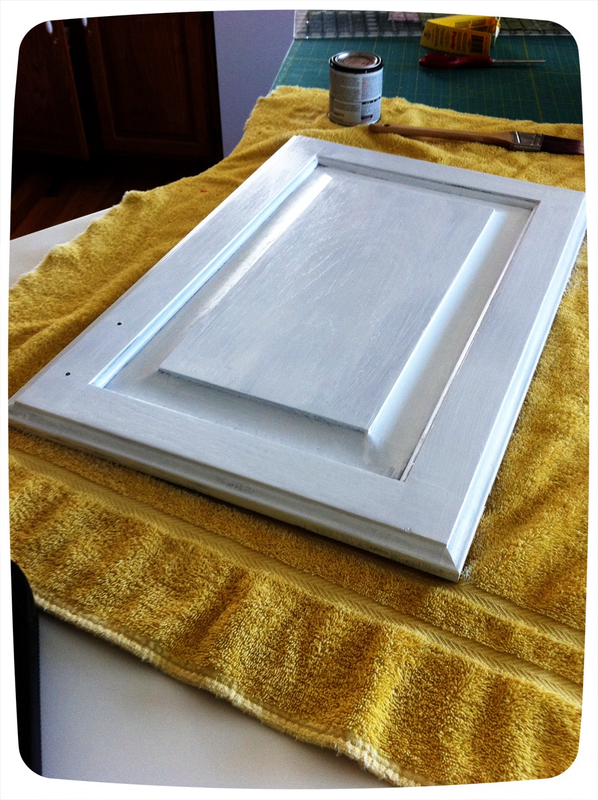 one door down, 4 to go! Don't look inside the cupboard, I am a stuffer! I am not sure what possessed me to start this but here goes! I am painting my laundry room cabinets a glossy white, I painted the walls aqua (a while ago)and then my sweet hubby bought me the red washer and dryer. I have been putting this off but today is the day! I got most of my tips off of young house love younghouselove So, what are you waiting for LETS PAINT!! 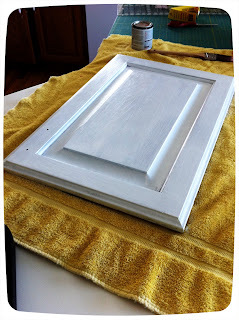 *if there is one piece of advice I could give you if you decide to do this is prepping your piece first, sand or strip and then used a good primer! On my blog surfing safari today I came across this Round Robin Quilt Along It looks like a lot of fun!! I love row quilts and that they are putting a modern twist to it. It doesn't start till July 5th so you have plenty of time to gather your fabrics together and start. Who's joining in? glue the next four flower with points in the middle but make sure these are overlapping your gaps from the row below. glue button or beads onto center to cover up points. flip upside down and glue clip or pin onto your back. Well, we have been planning and designing a "Mystery Halloween" wall hanging quilt. It is almost done and you guys are going to love it! It is an original design available only at the Material Girls Quilts and will start Tuesday July 5th from 7-8 pm. It is $5.00 registration fee and $8.95 a month with the finishing kit being sold separate. We will have a limited supply of kits so sign up now. Call the shop for details and to sign up. I will be posting a picture of the first row sometime this week. Come get your SPOOK on with us! Its going to be fun! 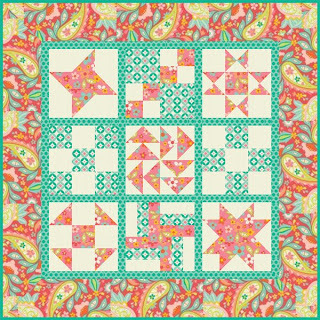 Riley Blake Fabrics has a tutorial page called "Cutting Corners" Over the next 3 months they are going to be teaching you all the basic quilting skills for making this quilt. This is a great beginner quilt, that will teach lots of different techniques, or you need to brush up on some skills. So if you have been wanting to learn to quilt this is a great one. The "Old New Fabric by Lecien. Has been posted on everyones blog. I bet we took a dozen calls this week asking if we have it. Well, we do have the entire line and it is going fast. So if you want this for your Farmers Wife Quilt Along you better hurry and give the shop a call 801-495-4290. It is like a 30 print line and very cute, I promise! Have you seen this book? 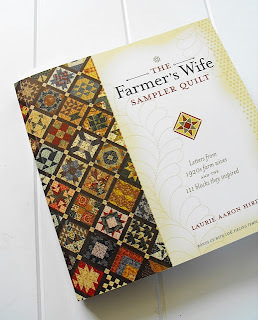 I have looked at this and thought "Someday, I am going to make this" It is a sampler quilt made with 111 six inch squares, with letters written from farmers wives in the 1920's Laurie Aaron Hird is the author check out her website. So some really cool uber-talented bloggers are doing it as a blog quilt along. Check out Fussy Cuts blog. Then from week to week you can follow along while you make your blocks!! My book isn't here yet so of course I will have some catching up to do. I will post pictures as I get going. Anybody else want to join along? Have you ever LOVED a pattern but thought that it was too much work, or you have plenty of projects already. At market the trend wad to "break it up" By this I mean instead of doing the whole quilt top do only a small portion of is and frame it or make a smaller project from the pattern. You can use pieced patterns, applique, stitching...the list goes on. Here is how I broke it up. 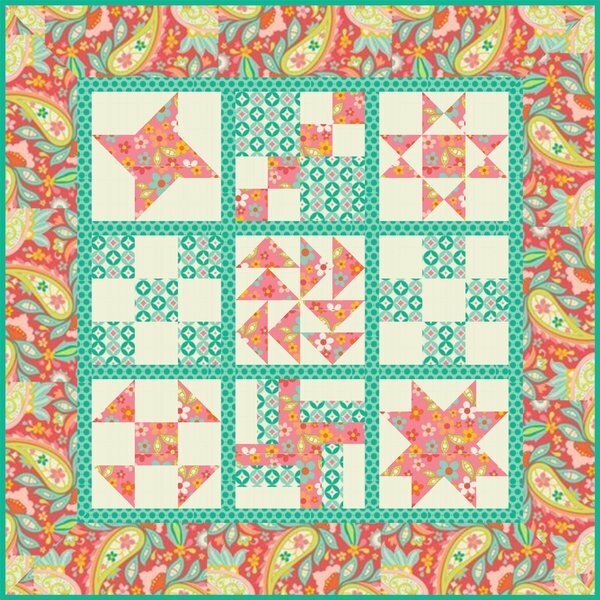 I LOVED this quilt by Don't look now but it is a ton of applique. DAUNTING!!! Instead of the entire quilt, I choose the letters of my son's name and made them individually on 12x12 squares and hung them in his room. NOT SO DAUNTING!!! I broke the squares up even more to fit in the frames I had. One of the girls at the shop took a square from complicated hexagon quilt and did one square and turned it into a pillow top. My favorite example of this from market was the designer took six quilt squares and framed them in an old window frame. The possibilities are endless when you "break it up"!! Over the weekend some really nasty person decided to start a rumor that we were closing Material Girls Quilts. That is not true!! 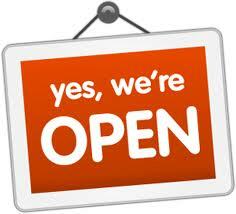 We plan to be Open and around a long time! It is sad that I have to even post this, for someones poor behavior. I love what I do and can't thank you enough for all your support and friendship! So, if you hear this rumor please put a stop to it, it's not true. WE ARE NOT CLOSING!! Oh, and on a side note to the persons spreading this rumor I hope you get a nasty case of skin fungus for telling such hurtful lies! Good Times for the Scenic Byway Hop!! 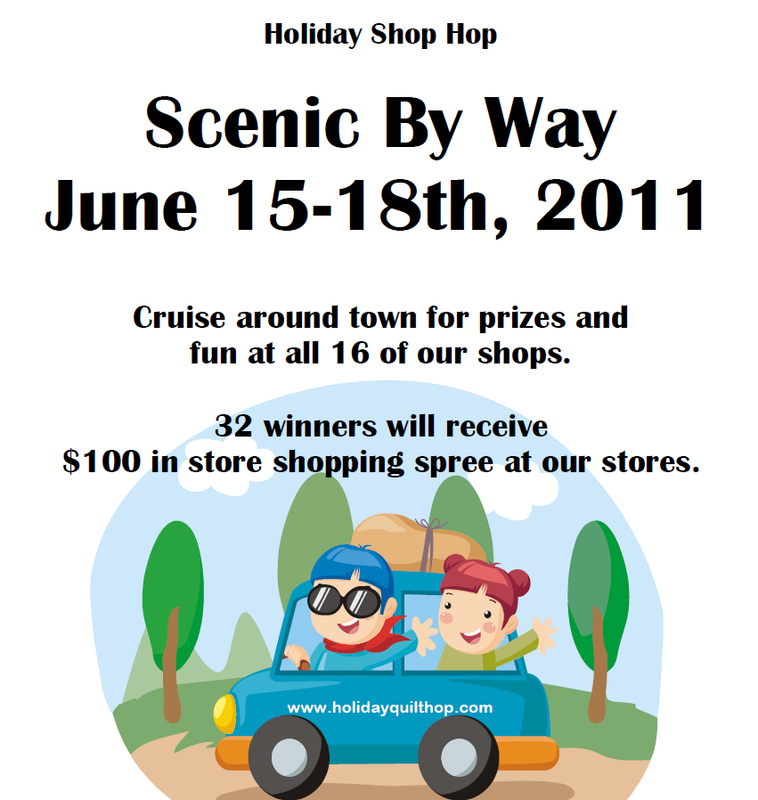 If you haven't made it by the shop for our "Scenic Byway Hop" here are some photos of our photo booth!! It has been crazy busy but we are having a blast!! Lots of prizes have been won and good times had. 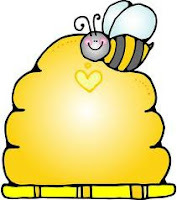 The hop goes until Saturday June 18th so there is still time to stop by ( oh, and be sure and try my awesome lemonade, its delish!) I will post more pictures later. 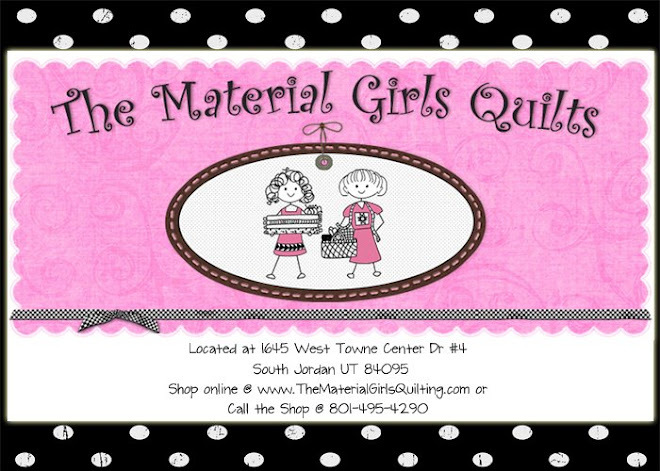 Oh, and on a side note, somebody decided to start a nasty rumor that Material Girls Quilts is closing their doors, that is untrue my friends we will be here for a long time. Yes, it must be Summer!! because it's time for the Scenic Byway Hop!! 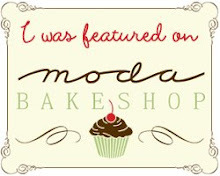 16 shops across the Wasatch Front will have a celebration in each of there shops! It starts Wednesday June 15 through Saturday June 18th. Our hours are from 9 am till 8 pm every night of the hop. 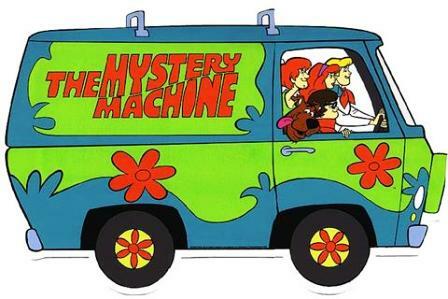 Everyone that comes in will receive a Free Prize and we will be doing a game or drawing with 2-4 prizes every hour. Refreshments, Photo Booth, drawing for prizes everyday! and so much FUN!! 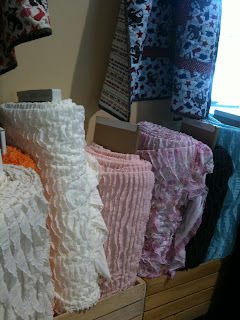 We are having a Luau, so come get your hula on with the Material Girls Quilts!! Oh, and lets not forget the faboulous SALES! *Fat quarters buy 5 get the 6th free! 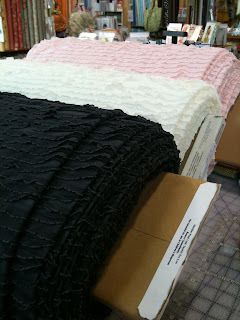 *Clearance fabrics take an additional $1.00 off per yard. 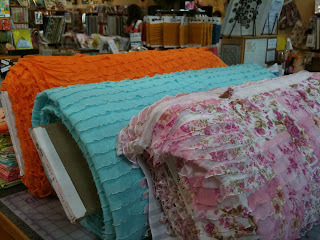 *Ty Pennington fabrics 20% off. Due to the fact that the fun and fabulous Scenic Byway Shop Hop is this week we are going to cancel Sizzix Club Flower Class this Thursday. We will meet up in June and make Two projects. The flowers and a pillow. Join us on then!!! Embroidery is gaining popularity. More designers are incorporating it into their designs. From quilts, to bags, to clothing. It isn’t just for wall hangings and pillows anymore. Too keep track of all those pesky needles here is a cute and easy needle keeper. Sew the two pieces of fabric right sides together with a 1/4 inch seam. make sure to leave a small opening in one side for turning. Clip excess seam allowance in all 4 corners. Speaking of stitching the shop will be having a stitching club. 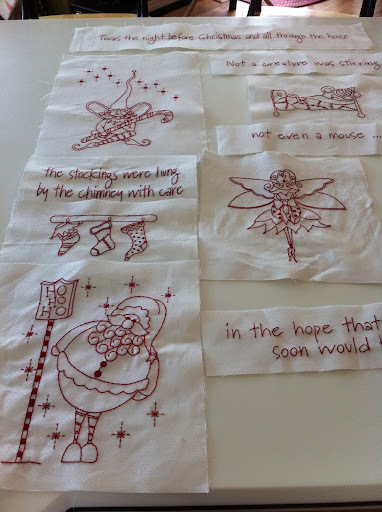 Nadine has picked out the most adorable Christmas quilt all done in reds and whites. Call the shop for more info and sign up to join. I know it seems early to start Christmas but I will never finish this otherwise. So who is interested in this as a Summer block of the month? 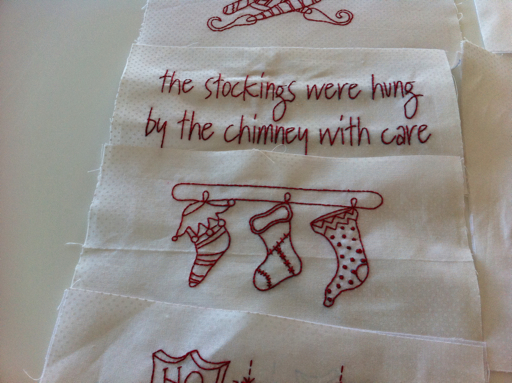 We will start this cute wall hanging by Hugs and Kisses from Australia on Thursday June 24th from 7pm till 8pm. If you are interested please call the shop, kits and patterns are separate and it is $10.00 for the class. Come get your stitch on with us! 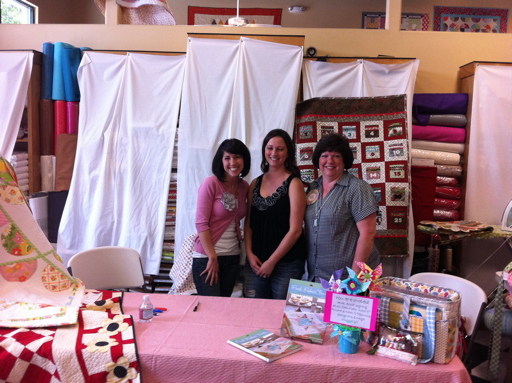 Get ready to party my quilting peeps!! 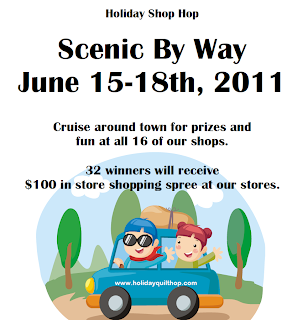 We are excited to announce we are part of "Scenic By Way" (yes, we have swapped teams) Join us for a BIG PARTY!! Wednesday June 15 through Saturday June 18. We have tons of fun planned! Prizes, Games, Refreshments and oh so much more!! This is one party you are not going to want to miss!! --cut wonder under into squares and iron onto the back of each charm square. --Cut your background fabric into 9 5 1/2 inch squares. --Iron and applique 1 of each size circle onto a background square. I off set each of my circles, but you can center your circles if you like. --Now join your rows together with the 18 inch strips. --Place your front and back piece (solid 18x18) right sides together. 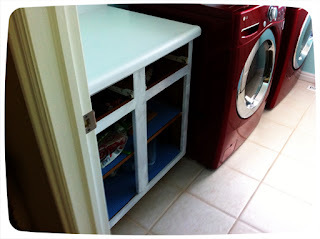 --Sew the sides and the top but leave the bottom open. 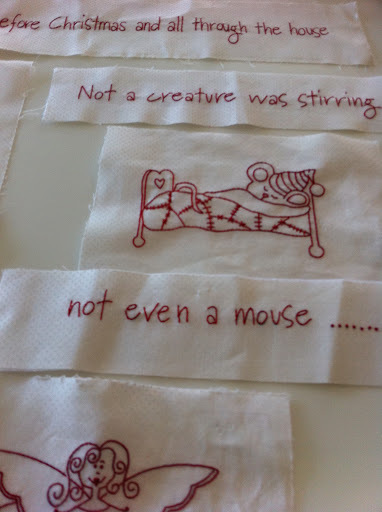 --Slide in your pillow form and hand stitch the bottom closed. You can use the scallop circle die cuts and it would match the trio of circles quilt from a previous tutorial. Be sure and tune in on Wednesday June 8 @ 1pm on Channel 2. We will be doing a craft segment with Casey and Kelly. Yes, Jamie is going, so I am sure her and Casey will have some fun dancing!! We will be giving away 2 gift card so be sure and tune in!! Extraordinaire's! You guys are awesome! So, at Market my girls fell in Love with this Ruffle Fabric. We couldn't make a decision on colors or what size ruffles so we ended up buying a lot. We have some cute models made up with it and I am sure you will be seeing even more. Skirts, pants, dresses, Oh the possibilities are endless!! Stop by this week and get yours!! On June 16th we will be offering a class on how to make fiber flowers using sizzix die cuts. You will learn two different types of flowers. All supplies are included in the cost. Also you can order the sizzix machine and dies at a reduced rate that night. The Class will be from 630 to 800 pm.